Waymo, the division of Google's parent company Alphabet that's dedicated to automated cars, recently announced that it'll soon start testing its self-driving minivans in Atlanta, Georgia. Unfortunately, we know little else about the Atlanta tests aside from the location, but the rollout should be soon. Last week Waymo started building 3D maps of the downtown Atlanta area in preparation for the launch, ensuring that the cars have an up-to-date reference before Waymo starts inviting locals to hop in the vehicles. 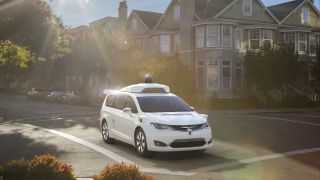 Waymo is currently testing its cars in two California cities (Mountain View and San Francisco), as well as in Phoenix, Austin, Detroit and Kirkland, Washington. With Atlanta added to the growing list, Waymo now has an impressively large number of driving conditions in which to test its cars, ranging from hills and extreme heat to rain and bitter cold. In recent months, in fact, the company has even started putting cars on the road without safety drivers in Arizona, although members of the general public aren't allowed to ride in these cars yet. Prior to that, Waymo produced a report showing that its cars had significantly lower rates of driver engagement than its competitors. Waymo has a massive lead, but other automated car companies are attempting to expand tests as well. As The Verge reports, Lyft and Aptiv offered a ride-hailing service for the city of Las Vegas during this month's CES 2018 conference. Originally, the plan was to end the service when the show wrapped up a little over a week ago, but the partnering companies have decided to let Las Vegas riders continue using the semi-autonomous service for the time being. Beyond that, Lyft and Aptiv are attempting to bring their service to other cities as well, with Boston looking like a likely location.